Radiation therapy uses high-energy radiation to shrink tumors and kill cancer cells (1). X-rays, gamma rays, and charged particles are types of radiation used for cancer treatment. The radiation may be delivered by a machine outside the body (external-beam radiation therapy), or it may come from radioactive material placed in the body near cancer cells (internal radiation therapy, also called brachytherapy). Systemic radiation therapy uses radioactive substances, such as radioactive iodine, that travel in the blood to kill cancer cells. About half of all cancer patients receive some type of radiation therapy sometime during the course of their treatment. How does radiation therapy kill cancer cells? Radiation therapy kills cancer cells by damaging their DNA (the molecules inside cells that carry genetic information and pass it from one generation to the next) (1). Radiation therapy can either damage DNA directly or create charged particles (free radicals) within the cells that can in turn damage the DNA. Cancer cells whose DNA is damaged beyond repair stop dividing or die. When the damaged cells die, they are broken down and eliminated by the body’s natural processes. Does radiation therapy kill only cancer cells? No, radiation therapy can also damage normal cells, leading to side effects. Doctors take potential damage to normal cells into account when planning a course of radiation therapy. The amount of radiation that normal tissue can safely receive is known for all parts of the body. Doctors use this information to help them decide where to aim radiation during treatment. 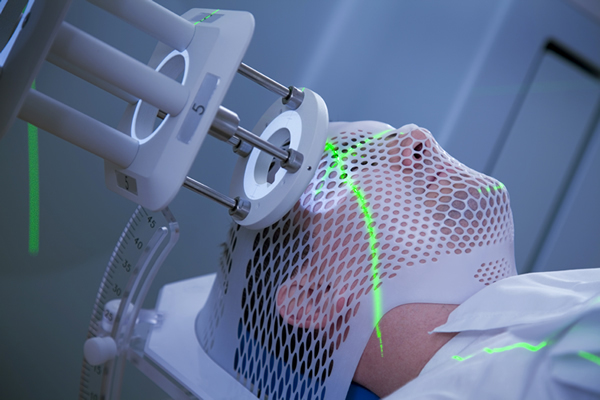 Why do patients receive radiation therapy? Radiation therapy is sometimes given with curative intent (that is, with the hope that the treatment will cure a cancer, either by eliminating a tumor, preventing cancer recurrence, or both) (1). In such cases, radiation therapy may be used alone or in combination with surgery, chemotherapy, or both. Radiation therapy may also be given with palliative intent. Palliative treatments are not intended to cure. Instead, they relieve symptoms and reduce the suffering caused by cancer. Radiation given to the brain to shrink tumors formed from cancer cells that have spread to the brain from another part of the body (metastases). Radiation given to shrink a tumor that is pressing on the spine or growing within a bone, which can cause pain. Radiation given to shrink a tumor near the esophagus, which can interfere with a patient’s ability to eat and drink.